Trains hey. Love them but they are not the most reliable and certainly susceptible to “inconveniences” being caused. Yesterday I had a stark reminder of this. My journey back from Royal Holloway to Guildford requires two changes, fortunately I was offered a lift to the first change en route and was looking forward to getting home earlier than anticipated. Due to the very sad occurrence of someone being hit by a train, I had an hour wait for a train to arrive to take me the 10 minutes from Weybridge to Woking. Upon alighting, I was faced with another hour wait for my connecting train to Guildford – again a ten minute journey. With no buses running that late, I had a choice between waiting for the train or paying for a taxi. In the end, I decided to run. A route I had cycled previously, I knew the way and estimated it to be about 6 miles in total and predicted I could be home within the hour at a comfortable pace, with the added bonus of warming up my frosty body. So at 21.50 I set off along the mostly unlit A320, in my loafers, chinos, jumper and coat, carrying my stuffed rucksack on my back. 50 minutes later I was back at home, sweatier and more blistered for the pleasure but home nonetheless – and quicker than waiting for my train. There are many aspects about running I could tease out of this anecdote to discuss further – appropriate clothing, appropriate routes, impromptu running etc – but in this post I want to explore running as a form of transport. A notion that has been rattling around my mind for quite a while now and certainly something I want to research much further, is the idea of running being a viable and efficient form of local transport that should be taken seriously. The vignette outlined above demonstrates that on occasion, running can actually be the quickest method of getting to where you want to go. Especially in dense urban areas when traffic can be slow moving and destinations not too distant from one another, running can offer a preferable mode for getting from A to B. Running is quicker than walking, requires less skill and expenditure than cycling, can be quicker than the tube (considering the vertical distance travelled), is less frustrating than being stuck in traffic and is a societal good in terms of environmental and health benefits. 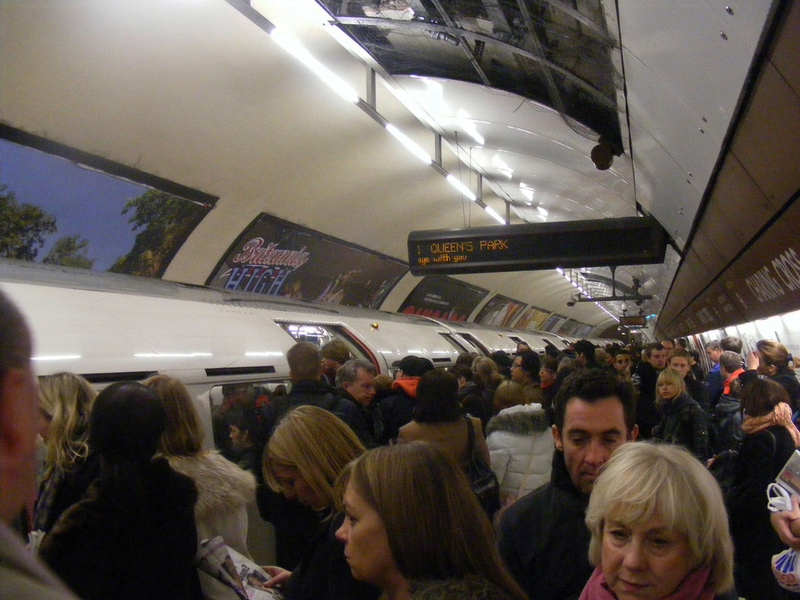 Recently Transport for London encouraged rush hour commuters to walk or cycle instead of taking trains on the London Underground in an attempt to reduce overcrowding – why not run? In my previous work I also spoke to many ‘commuting runners’ (a theme I am eager to develop) who do not necessarily run to/from work as it is their quickest/easiest option but because it fits in with the rhythms of their life. Many have young children and explained how when they return from work in the evenings, they want to spend time with their family and going for a run would certainly get in the way of this. Therefore, they chose to utilise moments when they are already travelling to conduct their running – two birds, one stone if you like. There are undoubtedly many other benefits of running for your commute – but this is not the time to explore them. Commuting running, or running as transport, differs from other types of running in one key visible aspect, that of its shape. There are four basic (simplified) shapes that a run can take and are identifiable when they become mapped. 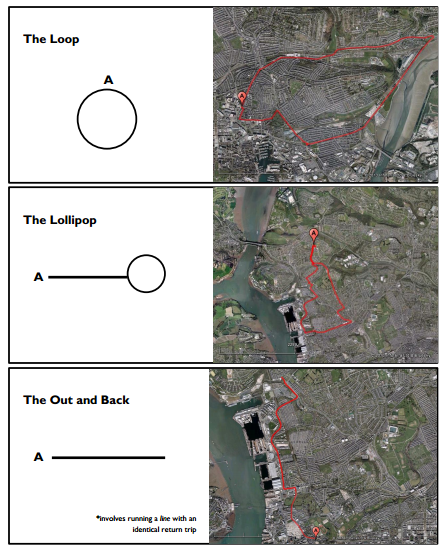 The most common types of run (loop, lollipop and out-and-back) could be termed ‘pointless’. This is not to say they have no reason to them, but that they tend to begin and end in the same place. Traditional rhetoric about moving in the social sciences has revolved around the relative benefits and negatives between the start and finish location (push and pull factors). Yet most runs do not conform to this displacement – the final destination would have been reached even if no movement had taken place at all. Running for transport purposes though does conform to this A to B discourse of movement (its shape is a Line) and it would be very interesting to see the ratio between pointless / pointful routes to understand the prevalence of this kind of running (although, routes could be A to B for other reasons than commuting – so caution would be needed). It is clear that running is rarely (if ever) considered to be a transport mode. Indeed, the presentation I’m giving on road-running at the AAG is in a session on ‘Alternative Mobilities’. Yet the more I ponder this, the less convinced I am that running is that alternative of a transport mode. John Bale has discussed how running was the second technology (after walking) that humans developed to overcome the distance of space and time. Elsewhere, Gregg Whelan has been concerned by how running relates to humanness and the role running played in our evolution and the development of Homo sapiens. Running is one of the oldest transport forms that humans have. In some parts of the world, running is still a very common form of transport. The great distance runner Haile Gebrselassie developed his trademark ‘wonky’ arm swing as a youth when running with his school books the 10 kilometers to and from school everyday when growing up in Ethiopia. Even in the (for want of a better term) ‘developed’/’western’ world, the amount of people who, without thought, break into a run as an emergency form of transport – overcoming distance and time – perhaps suggests it should not be so alternative. Being a commuter I get the joy of watching people run across station platforms to make their train, see people running to flag down their approaching bus, running to cross the road before the traffic lights change. This may be transport on the smallest of scales, yet running is being used to get from A to B in the most efficient way possible. If we count each of these occurrences as a journey made by running, I’d hasten to bet it would feature very highly on the transport league tables. Regardless of its standing – I would and will continue to make the case for running to be taken seriously as a mode of transport. It certainly offers an effective, just, environmentally friendly and physically beneficial form of local transport. After all, on average each person in the UK makes 364 trips a year under two miles and 628 under five miles – how many of these could be ran? This is of course also true of many other ‘alternative’ transport modes – skateboards, rollerblades, scooters – but currently my concern is with running. So what if we take running seriously as a transport mode? What is required to facilitate and encourage it? How can it be planned into transport policy? Do we need public water points? Public showers? Lockers? Running lanes? Should these be provided by businesses? What infrastructural and ideological changes do we need? I don’t know the answer to these questions but hope to investigate them much further in time. Reblogged this on Landscape Surgery. An interesting blog post. I walk from Euston to South Kensington everyday. I am seriously considering changing to running though to reduce the time it takes. Walking is not much slower than the respective tube journey and is definitely a lot more pleasant. A really interesting topic for research though. Thank you very Jennifer, glad to hear you might start to run your commute. I often run to stations but mostly because I am late for the train! I hope to really develop this topic and find out all the intricacies, positives and experiences of running as transport. So watch thus space! Really interesting article. I was struggling to get more running built in around my schedule, so in the end it was the realisation that the only time i can’t run is when i am physically at work. So, I get off at an earlier station – London Bridge and run to Victoria – usually making sure I make it up to 4 miles. As a treat on Fridays I run back via Tower Bridge to make 5.5 miles. I love run-commuting. Thanks very much. It’s great to hear about your run-commuting, it’s surprising how many different reasons there are for doing it as well as different practices – running the whole way, part of the way, everyday, every other day etc. Can I ask what facilities you have at work (or elsewhere) in terms of showers, changing, storage etc? Yeah. We have showers etc. I leave my suit and shoes at work and just take a new shirt in everyday. The rest of my commute is an hour on the train. Maybe m antisocial by sitting there smelly on the train home but I don’t let it worry me. I empathize. I took the subway. To run in New York is dangerous. You could get mugged or chased as if you had grabbed a pocketbook and worse of all get hit by a stagnated taxi cab driven by a driver who would not radio dispatch that there had been an accident because of insurance increase potential. Interesting idea, although running is a very distasteful idea to someone who, although I do not much appear to be, is terribly out of shape. In running, I have about ten seconds before I’m winded. Besides that, my legs are short so running isn’t very efficient for me. Thanks! I wasn’t thinking of running as a conscription – only for those who fancy it. Although the more you do it the easier it becomes! Great post but really reminded me how happy I am to not be living in London anymore! Thanks James – I have only just moved to the area so am still enjoying the novelty of it all. How long till that wears off? For me it was eight months, so mark the calendar! Great post though and huge congrats on being freshly pressed welcome to the club! Ah, I’ve already done 6 months! Thanks James, and thanks for taking the time to read and respond! I love running and often I think that I could run to the city center, the mall, the park or wherever I’m going to see my friends (I have done it), so I can have at least 1 extra hour in my day. The bad thing about this is that you can´t go everywhere when you’re all sweat. So public showers and public water points would be perfect. And running is FREE! You can be healthier and happier without spending money. Yes running seems such an obvious thing to do but it isn’t well-provided for. Being sweaty all day is not that appealing of a prospect – for either you or friends! great post. in DC I see more and more running commuters. for me, it’s just slightly shorter than biking (traffic lights take time in a city), and way faster than metro. I run to work 2-3 timezms a week, run home the other days. It just makes sense. I highly recommend a good running pack for clothes and incidentals. 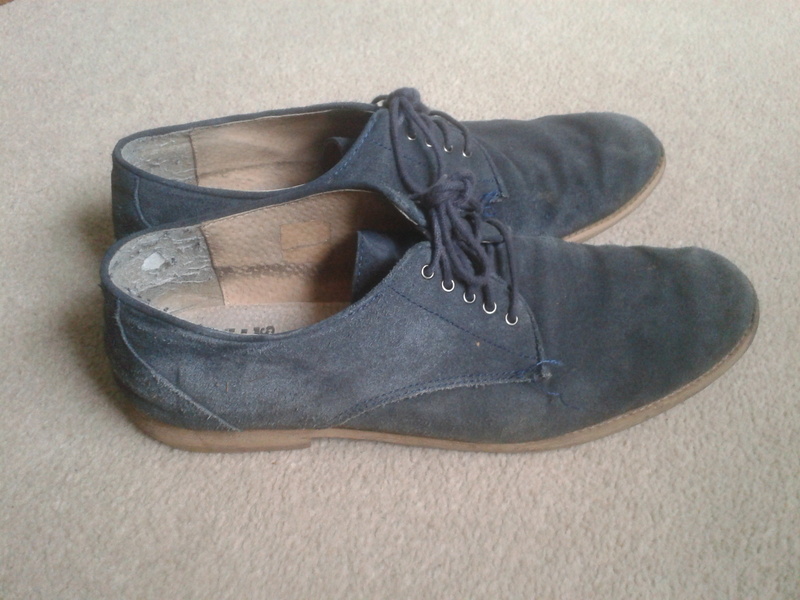 and run shoes of course! Thank a lot. It’s great to hear you run-commute. My commutes are 15miles+ so not that doable by foot! But agreed, a good running bag is essential. Maybe I’ll make a ‘top tips for run-commuting’. Running to work, getting your daily exercise and getting to work quicker than using public transport – seems like a no brainer to me! Although of course in the UK we not only have to battle the traffic both vehicles and people, but also the weather! Over the past few months, in the south, it would have been easier to swim to work! Another alternative transport mode! Yes the weather can be difficult – need to pack dry stuff, try and keep that dry in your bag and then dry your running stuff over the day if running home again! Running as a commute is a great idea (I commuted between Essex & Chelsea for five yrs and running from the City to the West End would have been quicker and definitely more agreeable). Get onto Boris to get this promoted. Thanks – I’ll see what I can do! I really enjoyed this write up, since about 8 weeks back I decided to start running again to try get back into shape, since I travel in a share vehicle and work about 80km away from home I found my time to run a bit short, so I identified routes that I could take along the travel route that our vehicle follows, so now instead of being dropped at home I alternate and have the driver drop me between 4 – 8 km away from home, depending on what sort of day I’ve had, then I commute run home. By the time I get home my exercise for the day is done and I only get home about 25min later than normal, it frees up so much more time to spend with the family! I used to live in Lexington, KY where the town is small enough to get to places on the “other side” of town on bike or foot in pretty reasonable time. My old roommate used to literally run errands. He would grab his knapsack and be back within the hour, having been to the post office, bank, and grocery store. I have just began running regularly and now live in Nashville, TN. Exploring my new city and perhaps getting a few things crossed off my to-do list would be a great way to enjoy my new favorite exercise. Thanks for the reminder! Excellent – hope you enjoy it. That ties in nicely to my latest post on ’Doing Things on the Move’ https://jographies.wordpress.com/2014/02/27/doing-things-on-the-move/ Some more things to think about when exploring Nashville! will it be too cold to run commute in winter? I would expect some seasonal variation but then again, running does warm you up! I think it was in Bernd Heinrich’s book, Why We Run, that he said he has traditionally run everywhere, as in, even from his parked car to the door of the store. I have adopted that practice, when possible, and find that even a quick jog creates a sense of well being, and, of course, is faster than walking. That’s taking running as transport to the extreme but I love it! Commute while exercising? Talk about multi-tasking! 🙂 I’ve done this on occasion, but usually when I’m equipped to run – for example, already wearing running shoes while making a run (literally and figuratively) to my favorite coffee shop. But for work? No…especially right now when the sidewalks are slushy and icy, and I’m wearing chunky winter boots! It´s like le lol !! Great article! I’ve thought about this too! Sometimes I do run places, but it can be a challenge when you arrive at your destination sweaty (office, work, other) and it lacks facilities to change or freshen up. I agree, we should include running in the transportation dialogue! Thanks a lot. Yes I think if running can be included in transport discourses then the responsibility for providing facilities shifts from runners ensuring they have (access to) the facilities to a more public effort to provide such infrastructure. It can only be good. My favorite thing about living in NYC is all the walking. It does make me feel good and keeps me fit. I try to walk whenever I can. An encouraging article for sure! Now that the snow is starting to melt in Minnesota, I will be biking and running more to and from work, which is about 3 miles. I walked a good number times or got rides from friends during the winter. Some days though, it was way too cold out to walk so I had to find a ride. I dislike taking the bus to such a short distance. The metro is tricky for my pick-up and destination any way. A bit off topic, but I really do enjoy getting rides from people. Because you get some special 1 on 1 time to talk to someone. I often only get 1 on 1 time when I get a ride from someone, or go with someone to an event. For highly populated cities, this can be a solution to all the traffic jam. But even if we make public showers or lockers; is every one will be OK to take a shower after every destination they reach? and everyone health condition is not same. Interesting questions to think about! I am certainly not conscribing running as transport – just trying to encourage/facilitate it for those who do want to. But I agree, it may be quite annoying to shower/change everytime. Perhaps running as part of an integrated personal transport regime. Not running all the time, but mixing it up with other forms of transport. I run the 9 miles to work regularly, during the summer. It is too difficult to carry a coat etc. in the winter, but in the warmer seasons I put shorts, underwear, and a shirt in a plastic bag and put them in my lightweight backpack. When I arrive at work I immediately go to the bathroom, strip naked, wipe off with paper towels, and redress in all clean dry clothes. I put the sweaty shorts, t shirt, and underwear in the bag i took the dry clothes out of and tie it up and put it in my backpack. When I get home after work, after taking the train, I dump the sweaty clothes ina bucket of water and then dry them out the next day. Really enjoyed your article! I took the plunge to cycle commute and then run commute a couple of years ago to maintain/improve fitness and to beat the traffic! Coming home in the car tonight at rush hour was a real frustration and I’m so pleased that using the car is a rare occurrence now for commuting! Thanks very much. I have just completed my MA thesis on run-commuting and will be doing more over my phd so stay tuned for updates!